Cornstalk residue can be a great winter feed resource for cows. Photo courtesy of Karla Jenkins. One of the first things producers need to do is to estimate the amount of residue available in a field for the cattle to graze. The amount of residue is proportional to the grain yield from the field and a simple formula will give producers a starting point in estimating the days of grazing they would have available. Cattle prefer to pick up dropped ears of corn, husks, and leaves and will not eat the stalks unless forced to. There is about 16 pounds of dry matter of leaves and husks for each bushel of grain produced. However, only about 8 pounds of dry matter are available to the cattle because of trampling loss. So for example, a field that produced 200 bushels per acre would have 1600 pounds of residue available for grazing. If it is assumed that a pregnant, non-lactating 1200 pound cow eats 26 pounds of dry forage each day then one acre would likely last about two months (1600/26). Research from the University of Nebraska showed pregnant dry cows given protein supplement gained body condition while non-supplemented cows did not. However, subsequent birth weight and pregnancy rates were similar suggesting the added cost of protein supplement to the spring calving cow over the winter when residue was adequate for grazing was not beneficial. 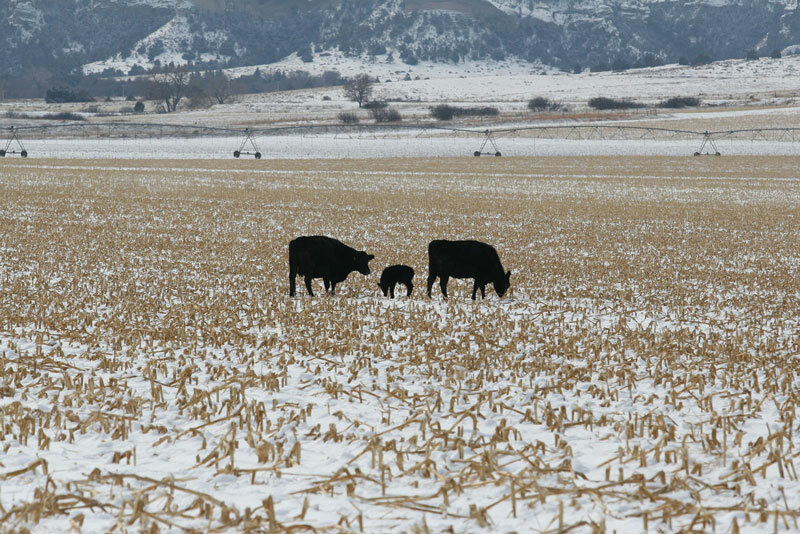 Late summer or fall calving cows grazing cornstalk residue with their nursing calves have a much higher nutrient requirement than their dry counterparts. For example, a pregnant dry 1200 pound cow only requires 8-10 pounds of total digestible nutrients (TDN) per day during mid-gestation, whereas that same cow requires 14-16 pounds of TDN during lactation. This does not account for the needs of the calf who will begin grazing within the first month of life. If the cow ate 26 pounds of residue and the residue was 50% TDN then she would only be consuming 13 pounds of TDN and could not meet her requirements. In a study utilizing residue grazing pairs, approximately 5 pounds of dried distillers grains was supplemented daily. The cows lost a little over half a body condition score but had acceptable breeding rates. The calves gained just under 2 pounds per day in this study conducted from November to April. If producers choose to place pairs on residue rather than wean the calves, the goals for calf gain and cow body condition score must be determined and supplement planned accordingly. However, the cost of gain must be carefully weighed against the value of the calf. University extension personnel are willing to assist with ration formulation. Some producers choose to run pregnant dry cows on cornstalk residue all winter and then calve on the residue in the spring, particularly in western Nebraska. This system works well and the residue fields are a good place to hold the new pairs until green grass is available. Producers need to remember the energy needs double once lactation starts and supplemental protein will be needed at that point as well. Cows in peak lactation will also increase dry matter intake by about 20% and residue fields in spring are likely becoming short on available residue and quality. However, supplemental diets can be developed to meet her needs and prevent her from losing body condition prior to rebreeding. Cornstalk residue can be a great winter feed resource for cows. Visit with extension personnel to determine supplement needs and estimated returns.